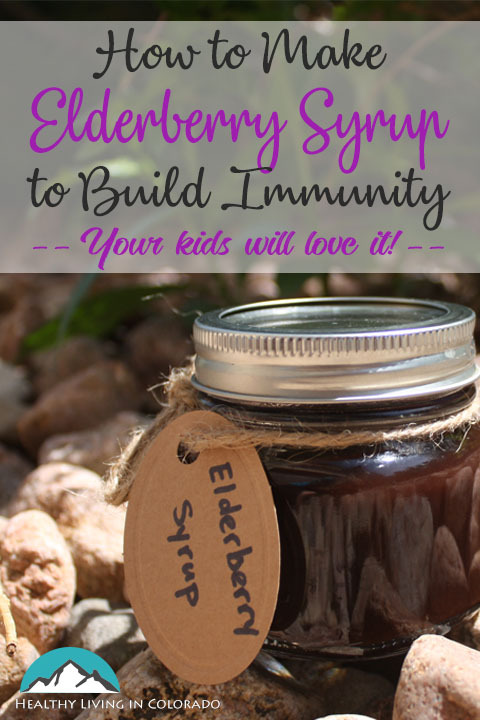 You can build immunity with DIY elderberry syrup this cold and flu season! Why Should We Take Elderberry Syrup? Whether or not you have children, I think we can all agree building our immunity in the fall and winter is a good idea. We have kids who are constantly being exposed to germs, snot, sneezes, and the like. But even in office environments or at grocery stores, germs spread on door knobs, faucets, papers, food boxes, and so many other things. reduce cold and flu symptoms if you get sick. 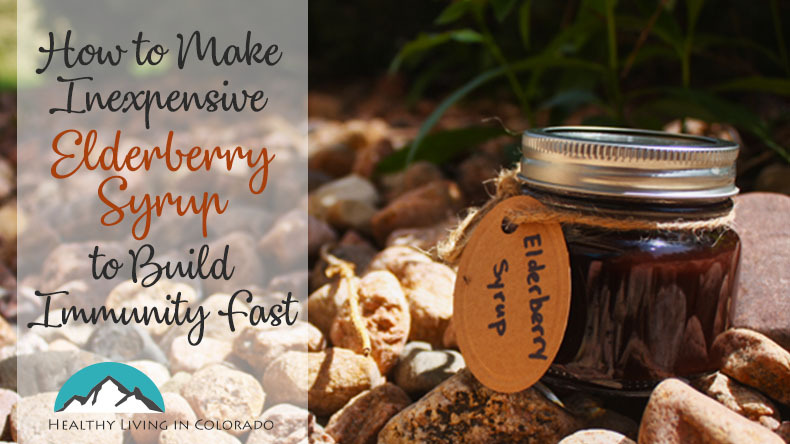 Elderberry syrup is a great way to get an immunity boost during the cold and flu season, and it tastes great! Kids love it because of it’s sweet flavor (mine like it on pancakes), and parents love it because it helps keep the family from catching colds. There are several brands you can buy at health food stores, but they are pricey. You can make this one yourself for a fraction of the cost. Add all ingredients (EXCEPT honey and On Guard if using) to a saucepan and bring to a boil. If using clove or clove powder, add it now. I just wait to add On Guard until it’s cooled down a little bit because the essential oil will not be quite as effective if boiled. Cover and lower heat until it’s at a simmer. After about 45 minutes or an hour, uncover and see if the liquid is about half gone. When this occurs, remove from heat and let cool about 20 minutes. Pour through a strainer into a mason jar. You can press the elderberries with the back of a spoon to release juice if you wish. Discard the elderberries and let the syrup cool until it’s just a little warm. Add honey and stir or shake until it’s melted in well. Keep refrigerated for up to 3 months. Wasn’t that easy, inexpensive, and yummy? I hope this helps you stay well this season. I got the base for this recipe here, but just made small adjustments which are listed above. Check out my post on how you can prevent a cold naturally here. Please post your comments below, and let me know if it’s helpful! Oh I will definitely be trying this recipe. Sounds so yummy! Oh, good! I hope it works well for you!